One of the most important considerations when designing probes for targeted sequencing is how related the the source sequences are to the potential samples that will be enriched. In phylogenetic studies of non-model organisms, there may not be prior sequences available in the target taxa, but minimizing sequence divergence is still important. One solution is to use any existing sequence data to design probes from multiple ortholgous sources per gene. This effectively increases probe tiling and should also broaden the use of the probe set to more divergent taxa. 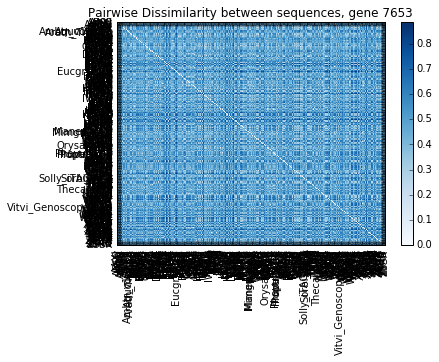 Given a sequence alignment, we can choose sequences that are representative of specific clades, but this may be biased. 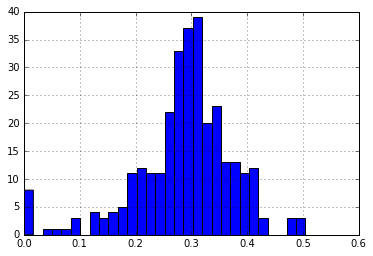 Instead, we can let the data tell us what the most representative sequences should be. In this notebook we will generate pairwise distance matrices from DNA sequence alignments. 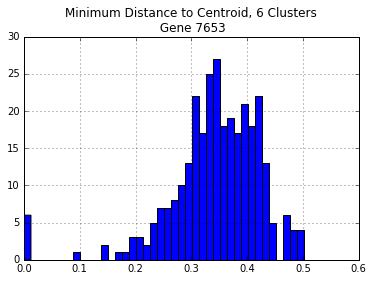 The distances will be clustered using one or more multivariate statistics techniques (such as k-means clustering or discrimant analysis) to explore the optimal number of clusters for the alignment, and we will select representative sequences from each cluster. We will use Python implementations of distance matrices and visualizations taken from the Introduction to Applied Bioinformatics. The MSA has a multiple sequence alignemnt of one gene from 1KP. We keep only the sequences from Angiosperms, including genome sequence. #This could be modified to remove columns that have 90% gaps, etc. The Hamming distance between two equal-length sequences is the proportion of differing characters. The square pairwise distance matrix is shown below. Now that we have a distance matrix, the next step is to decide which “representative” sequences are best for designing target capture probes. From the figure above we can see that some sequences diverged up to 80%, which is well beyond the tolerated range of 15-25%. One solution is to manually choose sequences. For instance, we could choose only genomic sequences that we “know” to be relatively diverged from one another, and hope that they represent the spectrum of divergences for this gene. Let’s try this by choosing: Arabidopsis, Amborella, Oryza, Vitis, Mimulus, and Populus. Instead, we could let the distances themselves tell us which sequences are best, by clustering the sequences by their pairwise dissimilarity. By pre-selecting a number of clusters, we can let the data tell us which sequences cluster together, and then choose a representative from each cluster. # Step size of the mesh. Decrease to increase the quality of the VQ. h = .02     # point in the mesh [x_min, m_max]x[y_min, y_max]. # Obtain labels for each point in mesh. Use last trained model. The figure plots the PCA transformation of the distance matrix– the axes correspond to PCA1 and PCA2, and each point represents a sequence in the alignment. The polygons are drawn to estimate the cluster boundaries in two dimensions. 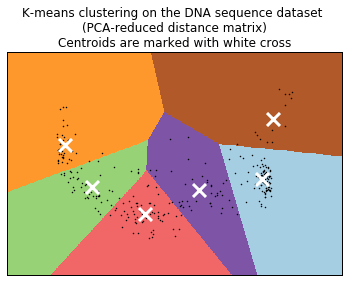 The white X represents the “centroid” of each cluster. 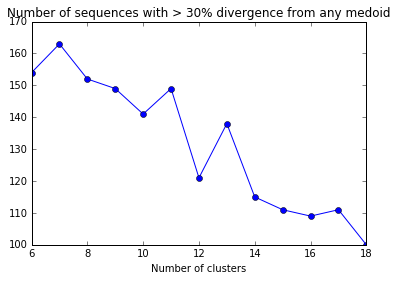 Now that we have predicted clusters, are these clusters sufficient to have all sequences within the cluster be no more than 30% divergent? For each cluster, we figure out which of the real sequences in each cluster is closest to the centroid (Euclidean distance). 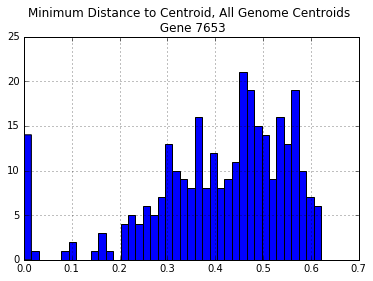 Then we figure out the maximum pairwise distance any sequence and the centroid sequences. #Find the sample that is closest to the centroid. This is a pd Dataframe row index. 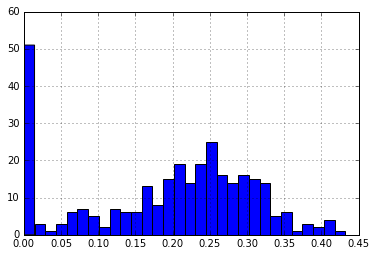 Before, using sequences from all of the genomes left almost twice as many sequences with > 30% divergence. 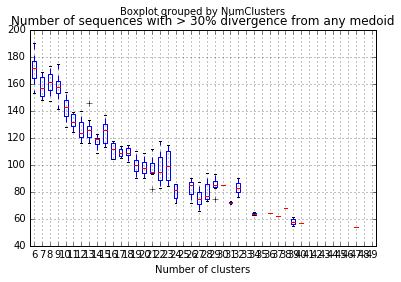 Ideally, we could pick the number of clusters that minimizes the number of sequences with > 30% divergence. 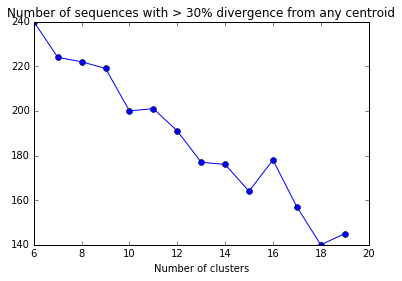 The number of sequences with > 30% divergence may fluctuate as the number of clusters is increased because the clusters (and centroids) may be chosen differently if the kmeans fit is repeated. In this case, choosing 13 or more clusters will have the best effect. Another option for assigning sequences to clusters is spectral clustering. /usr/local/lib/python3.5/site-packages/sklearn/utils/validation.py:629: UserWarning: Array is not symmetric, and will be converted to symmetric by average with its transpose. warnings.warn("Array is not symmetric, and will be converted "
The assignment of sequences to clusters is less important than reliably definining a “representative,” so we may need to explore alternative ways of “reducing” the distance data besides PCA. 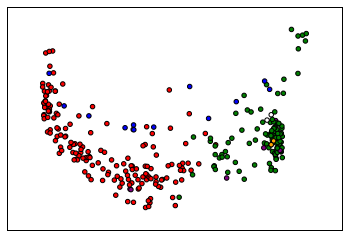 The principle is similar to k-means clustering, in that clusters are made by minimizing within-group distances. However, instead of centroids (which represent the “mean” of a cluster), the clusters are keyed around a specific point within the cluster (analagous to a median). 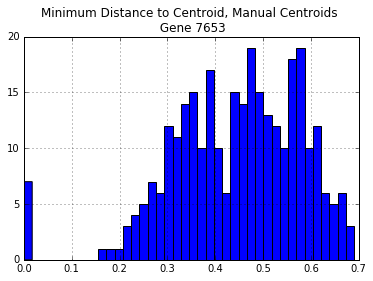 As a result, there will be no need to calculate which point is closest to the centroid, instead one specific sequence will be chosen as the medoid of each cluster. /usr/local/lib/python3.5/site-packages/numpy/core/_methods.py:59: RuntimeWarning: Mean of empty slice. It really doesn’t matter for our purposes which cluster each sequence belongs to. Our task is a minimizaiton exercise, so we should repeat each value of K a number of times. This suggests that for this gene there does exist a set of just ten taxa that could represent 98% of all seqeunces! The next step will be to write a dedicated script to systematically check K clusters until a minimum number of sequences is found to represent a maximum number of species.